Ideally, put your net in place before leaves begin falling. Then, simply pull it out when they’ve all dropped. 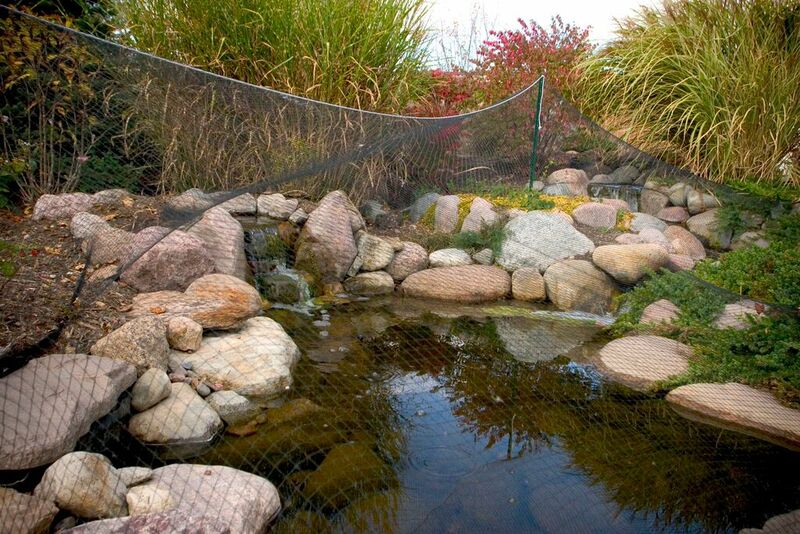 You can tent the net so it doesn’t sag into the pond when it gets weighted with leaves, say experts at Aquascape Inc.
Pond netting is only needed for a short time and will save you countless hours come spring. Ideally, put your net in place before leaves begin falling. Then, simply pull it out when they’ve all dropped. You can tent the net so it doesn’t sag into the pond when it gets weighted with leaves, say experts at Aquascape Inc.
Kelly also suggests trimming back and removing dead foliage from aquatic plants to help remove excessive organic material that would otherwise decompose in the water feature. Pond lilies are idyllic water plants. However, during early Fall, it’s a good idea to cut them back to just about the base of the plant; also trim back any marginal plants that might eventually droop over into the water. Since some debris will make it into your pond no matter how hard you work, Aquascape recommends adding a cold water bacteria treatment, which has concentrated strains of beneficial bacteria that works well below 50 degrees (F). Dave Kelly recommends adding it routinely to help maintain water clarity and quality. You can — and should — plump up your darlings to survive winter hibernation, by gradually increasing how much you feed the as temperatures start to drop. When pond water gets below 59 degrees, use fish food made for cold water. As the temperature continues to drop, gradually reduce the amount you feed them. Once temperatures go below 55 degrees, says Dave Kelly, the metabolisms of pond fish slow way down. And when pond water gets down to 50 degrees, do not feed the fish any more. Their systems shut down in the colder water, and food sits inside them and rots. They get very sick and diseased from this. How Are You Using Fall’s Harvest For Outdoor Displays? When it comes to Fall’s bounty, Mother Nature’s harvest — rich with gorgeous plants, fruits, vegetables and even berries — is perfect for decorating yards and front door entries. For ideas in what makes the best outdoor displays, we spoke with horticulture buyer Alison Caldwell at Hicks Nurseries (Westbury, Long Island). Caldwell adds that grouping interesting plants together in combo planters present a bigger punch of color and interest: beauties like Montauk daisies, with their white petals and yellow centers, hardy mums (also ideal for mass plantings on their own), and ornamental peppers. Of course, cabbages and kale are great options, which she says can last all through winter, if the weather isn’t too bad. Other tips: wheat sheaves can look great on an entry door, pumpkins in different colors can be mounded together in a planter on the veranda, or, if you’re crafty, you can make a wreath of small gourds and autumn berries for your door. Post (here or on Facebook) your own ideas for using Fall’s harvest to decorate outdoors. Believe it or not, the pumpkin is not a vegetable — it’s a fruit, and a berry at that! Along with hardy mums in bright yellow, at Deck and Patio’s design center in Huntington Station, we’ve added lots of these Fall “berries” for pops of bright orange. At Hicks Nurseries, mums are on great display. Because of their hearty color, they catch the eye at a distance as well as close up. Consider grouping them in only one or two colors for the most impact. Outside our design center, we have waterfalls flowing from a stream. Deck and Patio added white, yellow and orange mums along its banks. The full bush of green leaves shown at the top of the yellow mums is a marginal aquatic plant — the clump-forming Iris Versicolor. Aren’t these ornamental peppers beauties! Grown for their decorative value, although edible, they are rather lacking in flavor, as are the leaves and flowers of the deep red Celosia Cristata (aka cockscomb) behind them. Believed to be one of the world’s healthiest foods, kale and its looser central leaves is really cabbage that doesn’t form a head. Ornamental kale is ideal for your Fall garden; with its sister cabbage, they reach their best color when it gets cold. Note: ornamental kale isn’t quite as tasty as the supermarket kind, so best leave it in the garden. 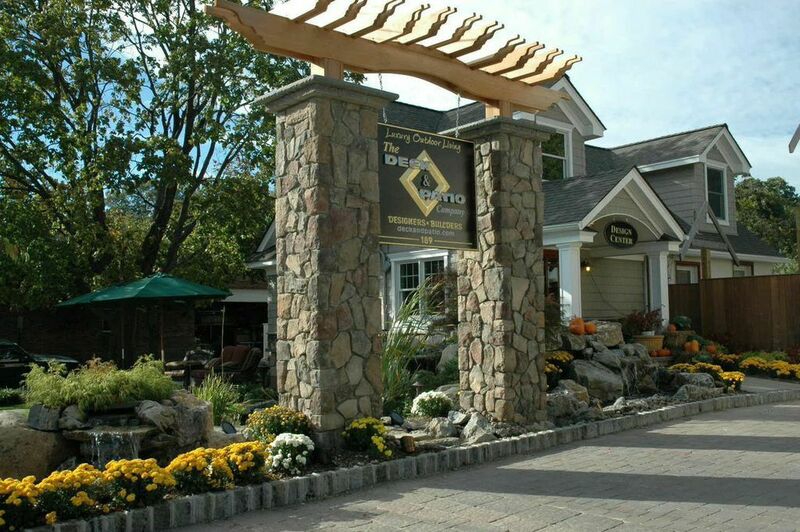 Wishing everyone happy gardening from The Deck and Patio Company, Huntington Station, NY! For Fiery Fall Foliage: Are You Barking Up the Right Trees? 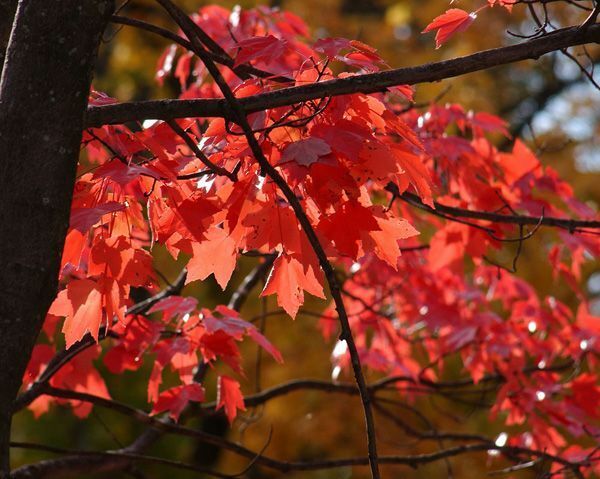 To get the lowdown on the best trees to plant for fiery Fall color, Deck and Patio spoke with Angelo Puleo, Nursery Division, Bissett Nursery (Holtsville, NY). Puleo also recommends the Cleveland Select Pear for robust color. Like the Oak and Maple, it is also hardy and can withstand most winds and storms, including ice storms —a real plus in our neck of the woods. “In Spring, the Cleveland Select bursts awake in beautiful white flowers, and in the Fall, its leaves offer up a deep orange-y-red blaze of color,” he says. Another option is the Crape Myrtle tree, which, as Puleo admits, is not quite as brilliant as the other trees, but it does offer an attractive reddish-orange color. When the Crape Myrtle finishes flowering in the Fall, it also pods-up with berries, and attracts such delightful visitors as the Yellow-rumped Warbler, a sweet little visitor who feeds on these berries after insects are gone. In addition, when it comes to smaller trees, Deck and Patio designers often consider Japanese Maples in landscaping plans; red-leafed versions of this beautiful tree offer degrees of red from Spring through Fall. Planting them in early Fall allows for new root growth in time for Spring. Note: Be sure to ask experts at an established nursery or landscaping firm which variety of maple, etc. will produce red leaves in the Fall, as some varieties offer up a blazing yellow instead. Not that there’s anything wrong with that… that’s just for another blog post. A beautiful shade tree in summer with brilliant color in autumn, the Red Maple can be planted any time of year, including Fall. Dig a hole twice the size of the root ball, place it in the ground, and fertilize and water well, says Angelo Puleo of Bisset Nurseries. The oak grows rapidly, making it an ideal choice. Like all the trees mentioned in this blog post, leave about 10 feet between each one when planting. Note: For those who keep horses, the oak’s acorn and leaves can be toxic to animals such as as horses. This tree offers up three great seasons of leaves, white blossoms in Spring (shown here), lively green leaves in Summer, and bright reds in Fall. A close cousin of the Cleveland Select Pear, the Bradford is pictured here as its leaves begin to turn from green to Fall-red. The Crape Myrtle tree that thrives on Long Island is a hybrid of other Crape Myrtles that flourish in warmer climates such as the Southern United States. Clusters of pink blossoms appear in late spring (shown here) which are so delicate and crinkly they look like they are made of crape paper. In Fall, it showcases bright red-orange-y leaves. In Fall, as they finish flowering, the leaves of the Crape Myrtle pod up into pretty berries. Escaping the harsher winters up north, the Yellow-rumped Warbler makes a home in our area as Fall sets in. With insects less available, it loves to feast on Crape Myrtle berries. If you plant this tree, this little fellow — and some of his friends — will no doubt visit and stay awhile. This beautiful Japanese Maple is native to Japan and other nearby Asian countries such as South Korea. It’s prized for the shape of its leaves and rich red color. With temperatures hovering close to 80 during September, summer has lingered here on Long Island. And while most have already closed their pools, a few diehards are squeezing every bit of enjoyment out of them. Most agree, however, that the time has come to close the pool down. To the uninitiated, closing a pool takes a few steps, says Deck and Patio’s Outdoor Living Expert, Bill Renter. 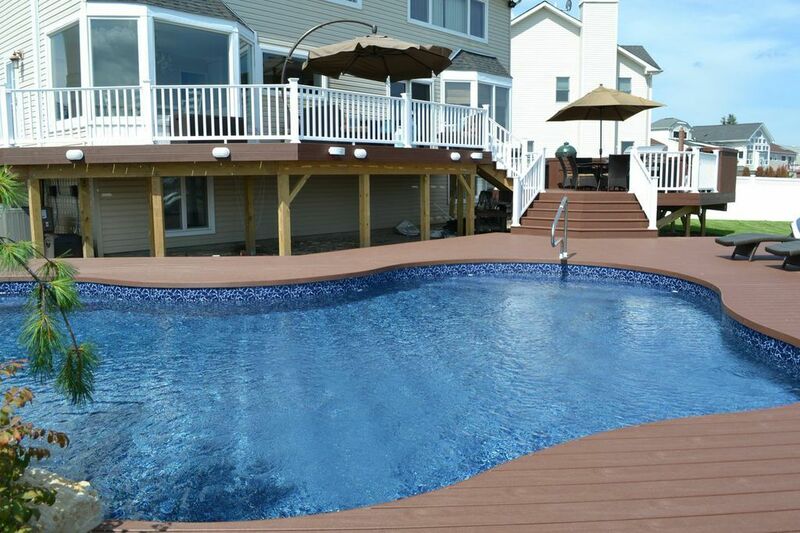 To get a full picture of what’s involved, our team spoke with a pool contractor who works with Bill on a regular basis — Michael Truehart, CSB, owner of True Blue Swimming Pools in Deer Park. “These covers are so taught, they act almost like a trampoline,” confirms Michael. Installing and measuring a mesh pool cover that involves freeform shapes, waterfalls, etc., must be exact. A mesh cover is strong because its straps with tension springs are connected to anchors set in the patio. For this pool’s water feature area, stainless steel eyelets were drilled into rocks where a cable secures it. For this job, because of the number of rocks involved, a separate Loop Loc cover for the spillover spa was required. Also: installing a hose and cord under the cover permits pumping water out later should too much rain fill up the partially drained pool. 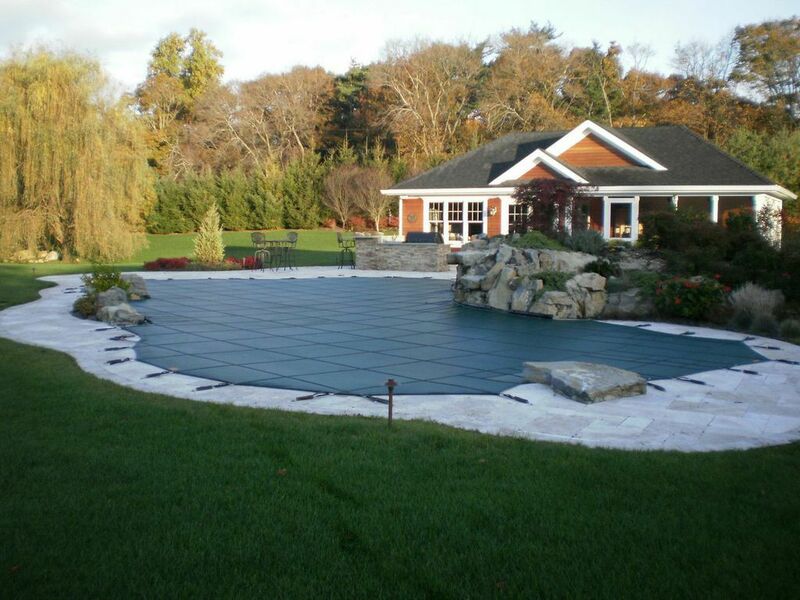 A bluestone area (with grass pepping through) forms part of this pool’s surround. In such areas where there is no hardscape to secure the necessary tension, little anchors are set into a pipe which, in turn, is set deep into the ground. To secure the pool around the grotto on the left — where the cover wraps inside it — the only way to install that was from in the pool on an inflatable raft. Without strong patio masonry to grip, the pool cover straps and anchors for this pool are set in a pipe anchored into the gravel. For all these jobs, the pool contractor used “Image Loc,” a special measuring process where taking photos from several views are input into a computer which does the measuring. This system works much like forensic technology.